Each year, 175,000 children are diagnosed with Pediatric Cancers. In 2006, 13-year-old James A. Ragan was one of those children. Over the course of the next 7 years, James underwent a grueling treatment regimen of chemotherapy, surgeries, radiation, and FDA and experimental drug trials. 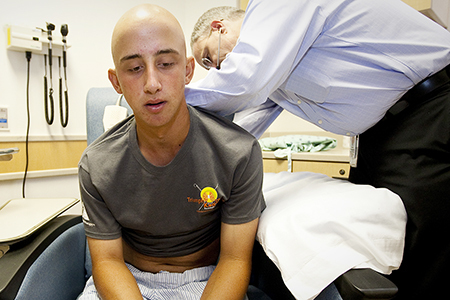 The protocols and drugs used in his treatment have seen little improvement in decades, and with only 4% of federal research funding going to pediatric cancer Research, James saw firsthand the effect of the critical funding gap for research into pediatric cancer research. From 2006 onwards, James dedicated the remainder of his life to raising awareness and funds for this cause. In early 2014, as his battle with cancer drew to a close, James reflected on the immense impact that the foundation could have by expanding its mission to include not just research, but bringing joy and happiness to the daily lives of children with cancer. Thus, the Triumph Over Kid Cancer foundation is dedicated to improving the lives of children with cancer by raising their spirits, raising the public’s awareness, and funding research to improve the treatment and survivability of pediatric cancers. The Triumph Over Kid Cancer Foundation has been coming gradually into existence since 2007. I was diagnosed with bone cancer in 2006 at the age of 13. By the time my next birthday rolled around I couldn’t think of anything I really wanted for my birthday, so I decided to throw a Toga Party, have guests give 50 dollars instead of a gift, and then split the money raised between the pediatric oncology departments at Driscoll Children’s Hospital and M.D. Anderson Cancer Center. 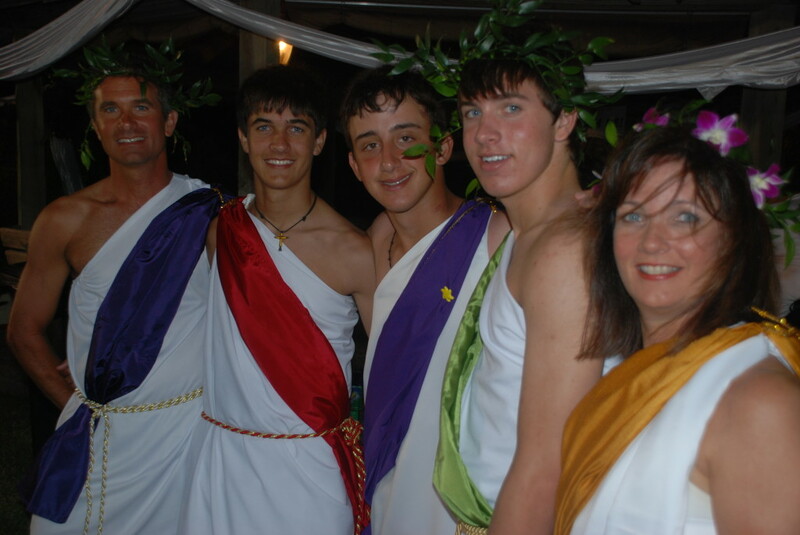 The theme was ‘Triumph Over Kid Cancer – Fighting Kid Cancer One Toga Party at a Time’ since 2007! Not only was it a lot of fun, but we raised about $40,000 dollars. By the time another year rolled by, I decided to try to raise more money by adding a golf tournament to it. We kept the same theme and this time raised over $100,000.00, and also did well in 2009. While all this was going well though, my cancer wasn’t. One of the problems with bone cancer (and other cancers as well) is that the cancers metastasize into other parts of the body. For me, it metastasized into my lungs. When they first told me that, I realized that the only thing worse than being told you have cancer, is being told you have cancer AGAIN! The first treatments for the bone cancer were bad enough. There were months of heavy chemotherapy with horrible side effects, followed by surgery that removed 40% of my femur, my knee and 20% of my tibia and replaced them with metal, followed by months of physical therapy to regain use of my leg, followed by several more months of chemotherapy. With lung metastases, they have to go into your chest cavity, remove you lung, cut out the tumors, reinsert the lung and re-inflate it. The recovery period is long and painful. After the third lung surgery, I was asking my doctor about future drug treatment options to be used in conjunction with my surgeries. Unfortunately, he explained to me that there weren’t really any treatment options that offered a cure, and that I should live my life when I was healthy and have the tumors removed as they recurred for as long as I could. There simply weren’t any treatment options with any proven scientific benefit. After that discussion, I thought a lot about the situation and began to look into why there had been no advances in treatment of this disease since long before I was even born. The problem (aside from the fact that understanding cancer and how to treat it is very complex) is that there are only about 1500 new bone cancer cases a year, so there is not a large market for a drug that could treat bone cancer even if you had it. So there is no incentive on drug companies to pump a lot of money into finding a cure because there is no large profit potential. I also learned that cancer research is very expensive. For example, at some point nearly all cancer drugs are tested on special genetically designed mice. These mice, because of the complexity of building them to a particular genetic model can cost as much as 10,000.00 dollars per mouse. So you can imagine the cost of an entire research project. While I have been fortunate so far and have the ability to live a full life when I was not in cancer treatment, I have watched many of my friends with the same or related cancers get worse and worse over time and die an ugly and painful death. The combined effect of all of this was that I realized that nothing would change unless normal people did something, and since there is no time like the present, I and my friends and family (especially my sister Mecklin) formally organized the Triumph Over Kid Cancer Foundation. You will notice that in our logo (the logo was designed by my cousin Ely and me) the “O” is a circle with a design in it being held up by a child. The design in the circle is from the original Toga Party. As gifts to the people who came, we gave belt buckles. The buckles were designed to symbolize my successful (to that point) fight against Osteosarcoma. The background is a magnification of actual Osteosarcoma cells. Superimposed over it is a tree trunk to symbolize life and strength. Engraved in the trunk of the tree is the word TRIUMPH. Thus the name Triumph Over Kid Cancer. I know that it is difficult if not impossible to understand the importance of cancer until it hits you or a family member. I know I never even considered it until it hit me. But the problem with it is that it can strike anyone at any time. We were just a normal family and I was a normal kid. I went to school, studied, played sports, went to parties… everything was normal and I never had any reason to even think about cancer. It is natural not to think of it if it doesn’t directly affect you. But there are two reasons I would like you to think about when deciding whether or not and to what extent to help our foundation. First, the kids who suffer with this disease are typically happy athletic outgoing kids who for no reason find themselves over a period of 2 – 5 years dying a slow death that is both physically painful for them and emotionally painful for their friends and families. Nearly every religion or philosophy in the world teaches that all of us should help others who are facing difficulties, and I can tell you that the people afflicted with pediatric bone cancer are seriously facing difficulties. Second, the disease strikes normal every day people from all walks of life. I hope desperately that it never touches anyone in your life. But I can promise you, that if you help us now, and it ever does affect someone you are close to, you will remember the day that you helped us Triumph Over Kid Cancer.